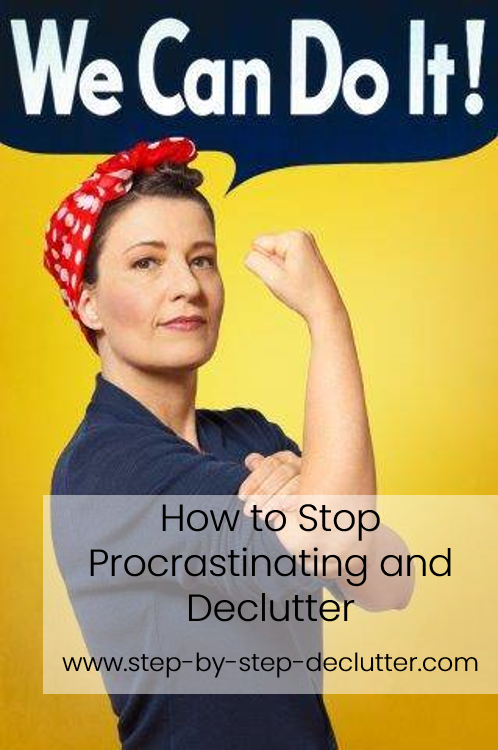 Are you ready to stop procrastinating and declutter? It’s never too late! As I am writing this, the buds are forming on the trees outside and my tulips are pushing up through the warm earth. It’s early March, and I am reflecting on the goals I set in January, those well-intentioned New Year’s resolutions. I confess I have not made as much progress with my goals as I would have liked… Maybe the same is true for you. Maybe decluttering was on your list of New Year’s resolutions. If it was, that’s great! If you haven’t quite gotten around to it yet, don’t despair and don’t give up. Nike® had the right idea when they went with this simple yet suggestive phrase as their slogan. It’s a truism that applies to procrastination with the same accuracy as it applies to scoring points on the court or winning a race. My resolution this year is about weight loss. While I haven’t lost as much weight as I hoped to at this point in the year, I have lost weight (14 lbs. to be exact). The success I have enjoyed (albeit limited) came when I decided to stop procrastinating and do it. It’s that simple. I knew what I needed to do and how to do it. I just kept putting it off, making excuses for why tomorrow was a better day to begin than today. The first, and perhaps most important, step in this process is to get started. Do something. Give yourself a taste of success. You’ll find it suits you! Best of all, success breeds motivation. The more success you have, the more motivated you will be to keep at it. Chunking is the process of breaking big tasks (which can often seem overwhelming) into smaller, more manageable tasks. Chunking is a great way to stop procrastinating those seemingly insurmountable decluttering tasks. Begin by analyzing the task and breaking it down into small, easy-to-accomplish mini-tasks. Doing so will give you a good feel for the actual amount of time and effort involved in completion of the task and allow you to make informed decisions about how best to utilize your time. One reason people put off decluttering is because it seems like it will take forever. Instead of trying to go the long haul, stop procrastinating and commit yourself to working steadily for a certain period of time, say an hour. Set a timer to keep you on task. Don’t stop until it goes off. If you finish what you hoped to accomplish and the timer is still running, keep working! It’s amazing what can be accomplished in an hour of uninterrupted effort. One of accomplishment's biggest enemies is distraction. The siren call of the modern world is technology. All day long our devices ding and chime with the alluring call of tweets, messages, push notifications and other distracting tones begging us to drop what we’re doing and take a quick peek. You know as well as I do there is no such thing as a quick peek. Give in to the temptation to check a social media account and the next thing you know you’ve lost half an hour of your life. For a person prone to procrastinating a certain task – say, decluttering – such inducements can be fatal to progress. One great way to stop procrastinating is to eliminate such distractions. Decide on a time when you are going to work on your decluttering goal and then silence anything that is likely to entice you away from your intended purpose. Turn off your phone and put it where you won’t hear it buzz or vibrate, preferably in another room. As a further deterrent to temptation, this app requires you to reboot your device in order to get back online ahead of schedule. The Freedom app may not be for everyone as it does come at a cost. There are monthly ($6.99) and annual (approximately $29) options available. My husband often touts the 80% solution. It’s the idea that it is better work until you achieve 80% of what you set out to do than it is to not do anything because you can’t do 100%. What we’re really talking about here is counter-perfectionism. Perfectionism is one of the biggest obstacles to decluttering. People know they will never be able to declutter their homes 100%, so they determine not to do it all. This is the very definition of counterproductive. In other words, don’t fret over what you haven’t achieved. Just get started without delay and you'll have great things to look forward to in the future. All of us fall victim to the temptation to procrastinate from time to time. Don’t let it defeat your vision of a clutter-free home. If you liked this page (and I hope you did), please share it. You can use the collapsible buttons on the right of your screen. Please post your thoughts on the topic in the comments section below as well. I'd love to hear from you!